Nail polish is wonderful stuff. Traditionally used to make our hands look more pretty. And may I just say I think it does a great job of this. I love adding a splash of color to my hands. Nowadays however, technology and science has advanced to the point where we can also get nail polish that not only makes our nails look prettier, but also strengthens them. So what is the best nail polish to strengthen nails? Good question! In this post I aim to answer it and provide some guidance for helping to choose the best nail polish to improve both the health and appearance of your nails. Want to know how to stop your nails breaking? How to stop your nails becoming brittle? How to make your nails smoother? How to make your nails stronger? How to make your nails thicker? How to make your nails shinier? Of course you do. We all do. I would bet that every single woman on this planet has pondered the answer to at least one of those questions during her life. And many of us have lamented over all of them at some point or another! Like most things in life I think it’s quite simple. It’s easier to look after something than to fix it once it’s broken. Prevention is better than cure! Splitting nails, thin nails, brittle nails, soft nails, discolored nails – these are all signs of nail weakness that every woman wants to avoid. The medical term for these conditions is Onychoschizia. The reasons for these conditions vary and can be due to a range of things such as physical or hereditary conditions, dietary considerations, stress,environmental factors, lifestyle and more. So if your nails are soft and weak, then I recommend using a nail hardener. If they are hard and brittle, then I suggest a nail strengthener. It’s that simple. If you are a bit lazy like me then you will be very pleased to know that you can indeed use one product to both strengthen your nails and also make them look pretty. Simply use a nail strengthener or nail hardener as a base coat under your regular nail polish. As well as helping to make your nails stronger it provides a smooth base to make your top coat look nice and full. Follow the instructions – usually you would apply it anywhere from once a week to every other day or even every day for some products. I don’t like to change my polish too often as this is another thing that can damage your nails and make them weaker. For soft and weak nails I recommend using the Quimica Alemana Nail Hardener. Don’t let the price fool you; this is a top quality nail hardener and a favorite among many nail techs I know. It is particularly important to follow the instructions with this product because it is quite strong and if you use too much you will know about it – believe me! The only bad thing I have ever heard anyone say about this is that it stings or burns when they put it on but I am sure that is only because they didn’t follow the instructions and put on too much too soon. Suggested usage is once a week which is great for me because as I said, I don’t like to change my polish too often as nail polish remover is not good for your nails. For hard and weak or brittle nails I suggest OPI Nail Envy Nail Strengthener. This stuff is great especially if your nails are damaged from working in the garden or kitchen, or having gels or acrylics. 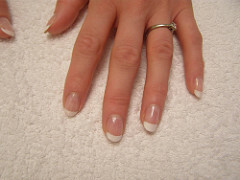 After just one week you will notice that your nails are stronger and less prone to breakage. The instructions are to apply two coats and then another coat every other day. The great thing about this stuff is that it comes in different colors which are actually pretty nice so you can use it on its own as well, without a top coat. There are other cheaper products out there but I would be wary of the as they can do more harm than good to fragile nails. Well, you made it to the end of my post. Hopefully I was able to help you choose what may well be the best nail polish to strengthen your nails. 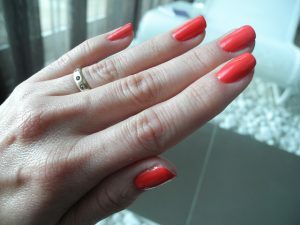 Don’t forget to always look after your nails and if you found this article good then you may also like this one: What Is The Best Nail Polish For Older Women? Also please follow me on Facebook, Twitter and Google +. Thanks for reading and have a great day!